GUS POYET abandoned Sunderland’s 3-5-2 formation, as he made five changes for the crunch visit of Burnley. The Sunderland boss reverted to a four-man defence after two games playing with three centre-halves, as the Black Cats looked to secure only their second home league win of the campaign. Adam Johnson and Costel Pantilimon both returned to the starting line-up after missing the previous weekend’s FA Cup stalemate against Fulham, but the three other changes to the side were more surprising. 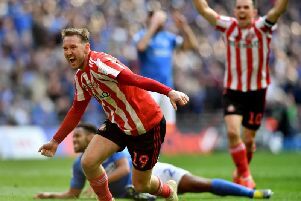 Connor Wickham was preferred to Steven Fletcher alongside Jermain Defoe up front, Anthony Reveillere came in for Billy Jones at right-back, and Jordi Gomez replaced the suspended Jack Rodwell. Burnley were unchanged from the side which lost 3-2 against Crystal Palace in their previous Premier League outing. SUNDERLAND: Pantilimon, Reveillere, Vergini, O’Shea, van Aanholt, Bridcutt, Gomez, Larsson, Johnson, Wickham, Defoe. Subs: Mannone, Jones, Fletcher, Graham, Alvarez, Coates, Giaccherini.